As soon as we got our first iPads, editing blog posts as well as creating new posts with our tablets was top of mind. You can always use the built-in browser, but a well done app would be very helpful as we would be using our big fingers on small site buttons. A few options have come out over the years and we have played with them all. Most take on the task of allowing the post creation of multiple kinds of blog service provider. WordPress themselves has an app that just does WordPress sites. With it’s recent updates, the app is getting moved towards the first screen of our iPad Launcher. Before we get into the workings of the WordPress universal app, let’s cover the update. 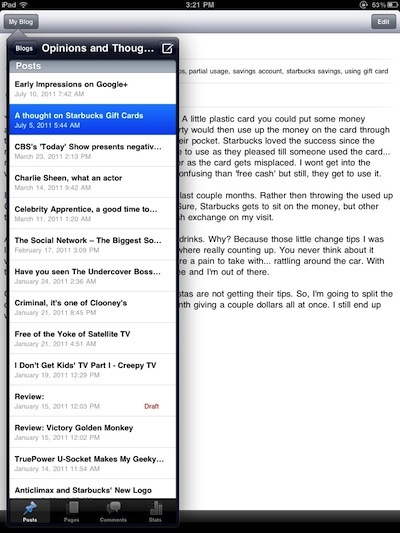 Being a specialized app/editor, Full Screen editing being added makes those longer posts much easier to manage. As well, the app now supports Rich Text editing so there is full control over bold, underline, etc… As before, adding a link to text still works fine but now you can test the link (or view links within comments) within the WordPress app. Lastly, navigation changes makes the app easier to use to load up the blogs you like to visit and use the app as a way to jump from one blog to another to keep up on your favorite sites without opening separate pages in your browser. 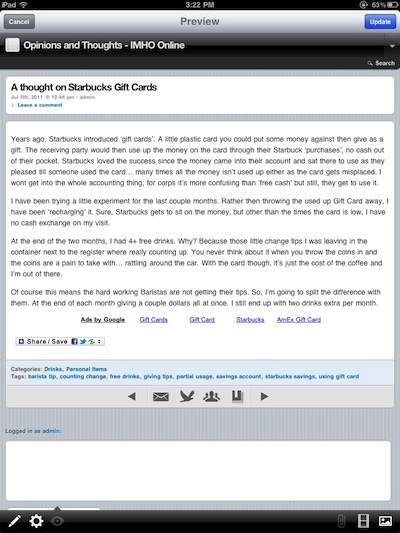 The WordPress app on the iPad allows you to set up many blogs to view and edit if you have the rights to. When you go to each site, you are given a view of posts which you can choose to view or edit as well create new posts. Choosing an article to edit or a new post creates a full page view to work with. Most apps, including the previous versions of the WordPress app had the edit view in a smaller layout. Along the top of the keyboard is quick access to bold, italic, adding links, viewing as HTML code and even bulleted lists! Previous versions and most of the other blog post apps for the iPad only allows you to get the post off your iPad by posting it to the live site. 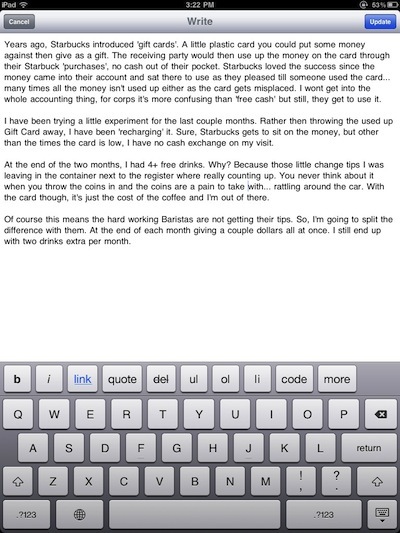 Many times we write a core article on the iPad and want to upload to the blog and have others fine tune. With the latest WordPress app, you can choose the status; Draft, Pending review and Published. Also available from this screen is the post availability and the date it was created. While writing your post, you can use the buttons in the lower right corner to add photos or video to your post like you would do on your desktop computer. Before the image is inserted, WordPress offers to quickly adjust the size to best match the needs of your blog. Multiple images can be inserted into a single post… a feature added a couple updates ago and as you see here we use it a lot! The ‘Custom’ option is exactly that. 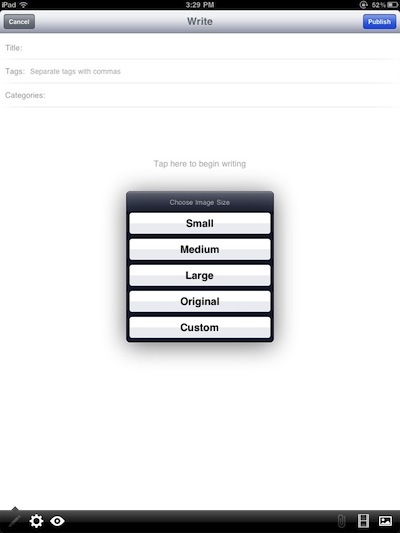 The WordPress app allows you to enter anything in the Width and Height dimensions. 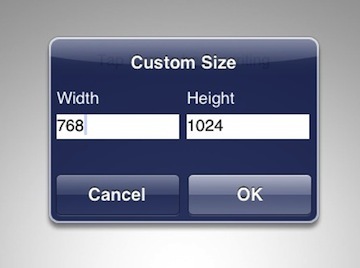 A ‘scale’ option would be nice so when we adjust width, the hight would auto set it’s self. Maybe in the next update, for now we are happy we have full control over adjusting our images to match the site’s needs. 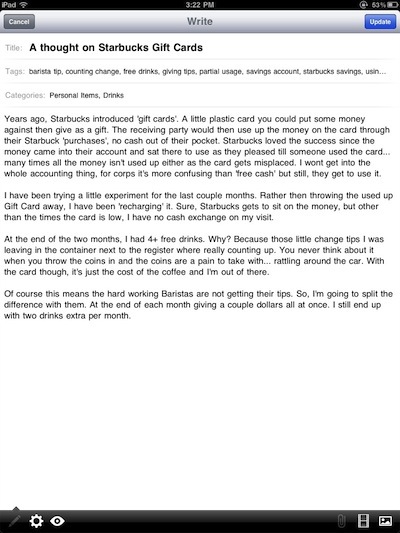 After editing, you can view your full post, full screen. 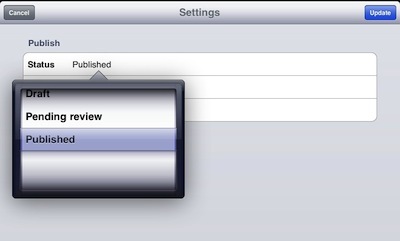 Tapping any fields lie Title, Tags and Categories will allow you to edit right on the iPad. Several other app we have tested required you upload the post to the site, then choose those fields there. Tap the ‘Update’ button when done. The full view of your posts as they appear to everyone online… or other sites can be viewed within the WordPress app. No need to jump out to the Browser then back to the app.